There was a recent article I read in the Economic Times about how “AI will cause role changes, not necessarily job losses”. It really made me think about what the future of AI will look like. I am the CEO of an AI-based company whose platform focuses on upskilling employees using intelligence. In so many conversations I have with my HR colleagues in various industries, I repeatedly get the feeling that people think AI will be a job killer. This also leads to wariness in adoption. There are so many articles written in the past few years on the pros and cons of introducing AI in the corporate environment. Some have even predicted machines will take over the world, but the truth is- no one knows the future. The human mind is extremely intelligent, and humans are resilient, however we have a tendency to fear the unknown. When it’s something new and we are not well versed in the idea, we assume the worst. Reality is, history has had many such transformational revolutions. In many instances, people feared these revolutions would be the death of many jobs. Over time we realized, these revolutions often led to a new generation of innovation and jobs, which co-existed nicely. During the late 70s and early 80s, when PC’s started to hit the market, many people thought it would be the end of Mainframe computing and would result in hundreds of thousands of jobs lost. After all, PCs’ were going to be nimble, faster, and allow for more innovations than the bulky mainframe. Fast-forward to 2018, mainframes still exist! They serve as the central nervous system of many industries, like finance and healthcare. What the mainframe has been able to is adapt to the changing times. This, in turn, created new opportunities for people and continues to be a staple for many organizations. Mainframes are far from extinct, and that means those working with mainframes are still relevant. Same story with the ATM. When ATM’s started becoming mainstream in mid-80s and 90’s, many people thought it would be the end of physical bank tellers. After all, why have a human when a machine can dispense the cash you need? Instead, the introduction of ATM’s created more backend call center jobs and allowed banks to be more efficient. Cashiers and ATM’s coexisted and ended up empowering the bank teller to be able to upskill to provide more value-added services to the customer. It’s not to say, new technologies will not be disruptive in some ways. 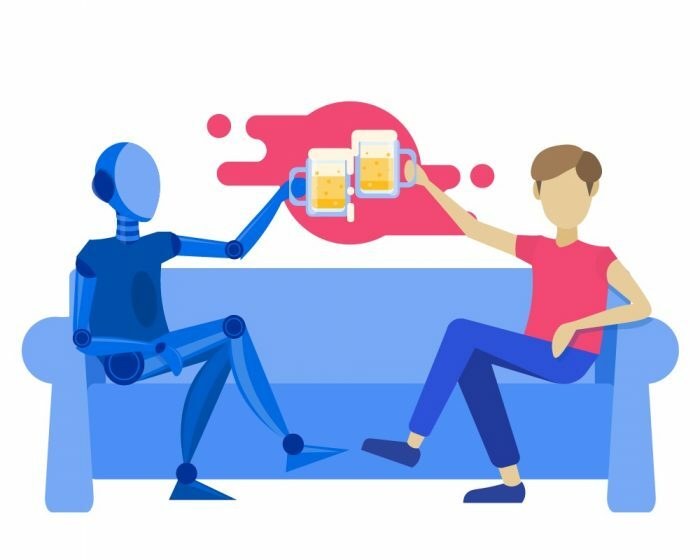 Artificial intelligence is being introduced in everything around us from driver-less cars, ChatBots, online shopping, etc. The application of AI will continue to expand over time and there will be some impact on jobs in the short-term. Certainly, jobs that are manual, or follow a consistent routine or structured set of actions could be subject to changes. However, as I mentioned earlier, the human mind is complex, and anything that requires flexibility, thought leadership, or creativity (thinking outside the box) is still well away from being taken over by a computer. Additionally, the roles that are ultimately reduced because of AI will have an opportunity to be reinvented and be upscaled with proper training. Debabrat Mishra, partner at Deloitte, said it quite well, in the same article, “The role of a data-entry clerk will be taken over by machines, but the role will be substituted by a data-validation clerk. A cashier’s role would be substituted by a query handler, a financial analyst by an adviser, a telemarketer by a personal adviser or marketing algorithm builder, a customer service executive by a customer”. Technology will continue to make inroads, now faster than ever but it’s also an opportunity for us to evolve and adapt. In organizations, large and small, managers and employees need to become leaders, and support functions such as HR & Operations need to bring thought leadership to the table. Focus on how intelligence will aide decision making, how manual tasks that are taken away can create capacity surplus allowing for productivity improvements. A post I wrote earlier in the year, is really relevant here, “We all know that in today’s competitive labor market retention of talent is key to organizational sustainability. Yet, why do so many HR and L&D functions continue with archaic models of employee development? I was talking to an HR manager about employee development. She said her managers identify the behavior skills gaps in their employees and then L&D arranges training workshops accordingly. This sounded like standard practice in many orgs, so I asked her some follow up questions: “How are you assessing if the manager is equipped to identify the development areas?” “Do you feel that grouping people together in workshops is the most effective way to objectively develop? “Her response was “I don’t have the budget” to do anything else. Employee development is not a ‘check-the-box’ exercise, it requires modernization of HR and L&D processes, incorporation of technology, AI and behavioral science to create a journey experience that is individualized for each employee. You need to baseline the starting levels for each employee, they need to be provided continuous feedback, training, curated content and recommendations, that is relevant to them and assessments to measure their achievements along the way. It doesn’t require more money! Redeploy budgets in the right place, use the intelligence to make data-driven decisions and turn L&D from a cost center to a profit center. “ AI is coming, but so what? Don’t be afraid, make it work for you! Excellent write up Devang. i like your example of the ATMs versus bank tellers.